HAMPTON, Va. — Dr. William R. Harvey and Mrs. Norma B. Harvey have gifted another $100,000 to their beloved “Home by the Sea,” adding to the $3,166,327 in personal donations already on the books from the university’s first couple. This latest $100,000 gift will fund study abroad scholarships designed to expose students to limitless opportunities in a vast and ever-expanding global marketplace. Dr. Harvey, an astute businessman, recognizes that successful careers, no matter what the industry, demand a level of international awareness that is best developed through travel, discovery and exploration. This $100,000 dollar gift for the study abroad program was preceded less than one year ago by another six-figure Harvey gift seeding an endowment of at least $3,000,000 in scholarships for students to attend the William R. Harvey Leadership Institute (WRHLI). There is an international studies component included in the program funded by that $100,000 donation as well. The many donations from Dr. William R. Harvey and Mrs. Norma B. Harvey have included covering salary increases during lean financial periods. 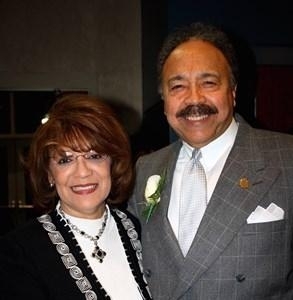 For example in 2011, Dr. and Mrs. Harvey gave a gift of $1 million to be utilized as incentives to increase faculty salaries. In 2011 and again in 2014, the Harveys gave donations of $166,000 and $108,403 respectively, to support wage increases for full-time permanent HU staff. The Harveys also made a generous donation to scholarships in 2001. That year they gave a gift of $1 million to fund scholarships for students interested in becoming K-12 teachers. As a visionary, Dr. Harvey, has embraced HU founder General Samuel Chapman Armstrong’s, mission to have everything at Hampton University excel. And excel it has under Dr. Harvey’s leadership. The Harvey years, will grace the record books as an unparalleled accounting of mega success, not just for the HU students, faculty and staff whose lives give testimony to the results of his labor; but for the global community of stakeholders who will continually reap the benefits of his astute leadership for generations to come. Dr. Harvey has introduced innovations, which have solidified Hampton University’s stellar position among the nation’s colleges and universities--seventy-six new academic programs, satellites on active missions in space, the largest free-standing proton therapy cancer treatment center in the world, 28 new structures, an increased endowment from 29 to 260 million dollars--all of what Dr. Harvey has accomplished speaks to his desire to leave the world better than he found it.